Just before Christmas, Sephora had a preview sale of the Hello Kitty products that are scheduled to launch later this month. Given my weakness for cuteness, it's some sort of miracle that I only bought three nail polishes (of eight colors available): Pink Sprinkles, Banana Cream, and Purple Sprinkles. I'm not usually a big fan of yellows, but Banana Cream impressed me. It was well behaved, especially for a pastel, going on in three coats with minimal streaking. I added two coats of Pink Sprinkles and got a look that made me think of springtime. 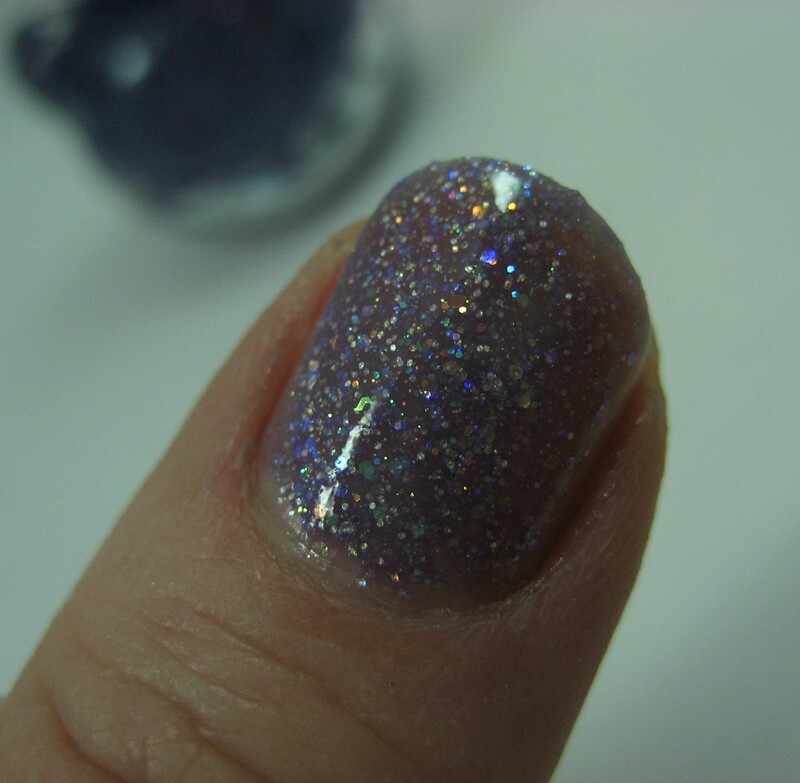 I only had time to swatch Purple Sprinkles on my thumb; I liked it it a lot. I did two coats and added top coat because it seemed a little bumpy on its own. I was surprised at how pigmented the base was and loved the dustiness of that base color contrasted with the glitter bits. 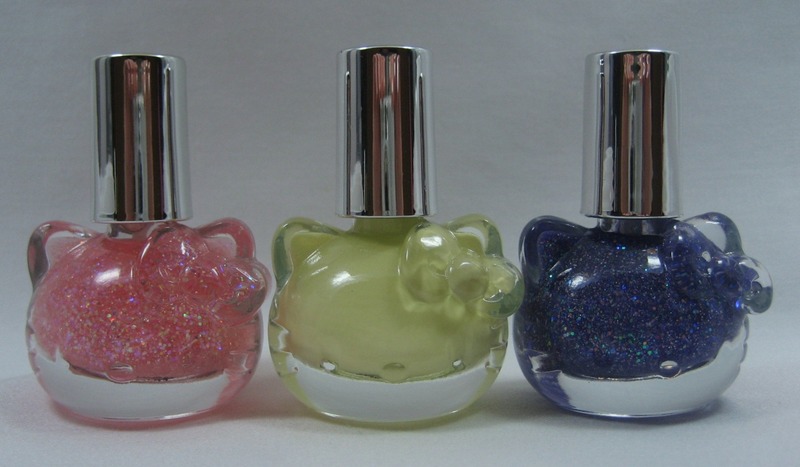 These were US$10 for 9 ml, so one definitely pays a premium for the kitty head bottle; in the case of Banana Cream and Purple Sprinkles, I think is was worth it. Pink Sprinkles doesn't seem as special, but still—kitty head bottle. Oh I things we do for Hello Kitty! Purple Sprinkles is awesome, these bottles WERE too hard to pass up since I grabbed myself two. Those bottles are so cute! 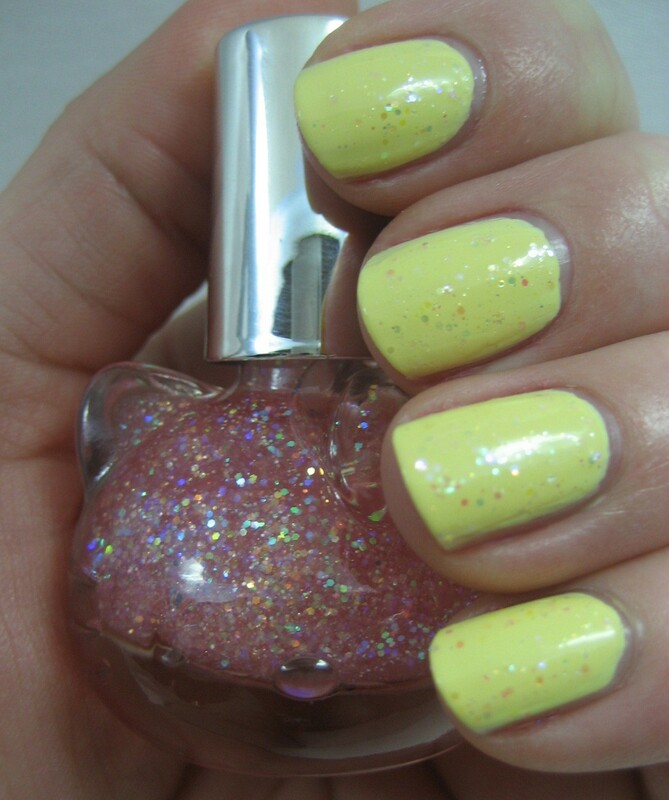 I also really like the yellow and the purple glitter, its probably a very nice layering polish! With the Banana Cream, does it smell? That would be so cool! I'm trying to get some scented np from HK to test out. Você por acaso vende essas preciosidades??? Love these Karen! So adorable! The specialness of these is definitely in the packaging but they still make for a very pretty manicure. This are really cute but the price + size = over priced in my opinion.